First off this is a great campaign and good on BNZ and the staff for doing it. 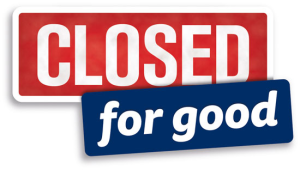 But is it me or does anyone else out there get caught out by the play on words Closed For Good? This is the 6th year they have run this campaign and I’m finally getting used to it, but I can’t help but think back to the second year they ran this when walking home one night and passing a BNZ branch, I saw a huge sign in the window with “Closed For Good” on it and I thought that that branch was permanently closed! This was reinforced in my mind the next day when I overheard other people who had seen the sign and were mourning the loss of their local branch.